Where Will the SPX end April 2017? If investors have been sitting on the sidelines while the market rallies, then it may be high time to jump in, according to one technical analyst. The CBOE Volatility index recently hit its highest level of the year, just above 16, as global geopolitical concerns pressure the markets, sending the S&P 500 sliding modestly toward the end of last week. This may signal a prime buying opportunity, according to Oppenheimer’s head of technical analysis, Ari Wald, who points to an intriguing relationship between the market’s moves and spikes in the VIX. Historically, when the VIX spikes while the market is in an uptrend, above-average returns tend to be seen in stocks over the next three to six months, Wald said. 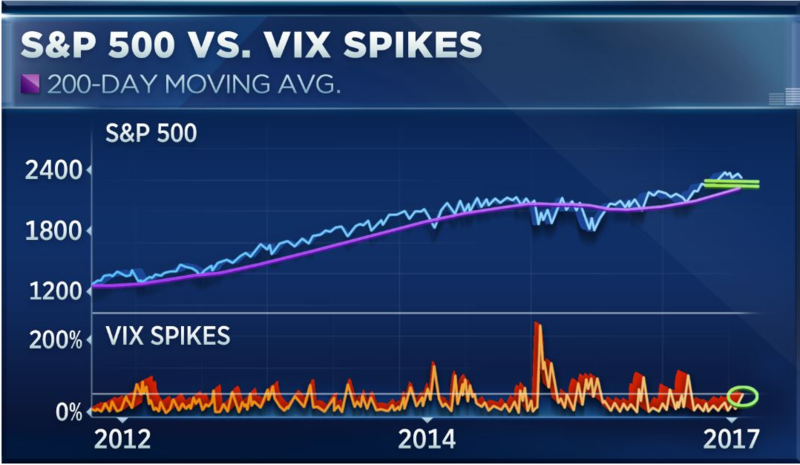 He defines a VIX “spike” as a reading that is 50 percent higher than its three-month low; he marks the S&P 500 in an uptrend when it trades above its 200-day moving average. Since 1990, when this signal between the VIX and the market is triggered as it was last Thursday, the average gain over the next six months has been 8 percent, versus 4 percent for any six-month period. “The numbers speak for itself; we think this pullback is an opportunity to buy,” Wald added Monday. The volatility index, often referred to as a measure of traders’ “fear” in the market and up 7 percent so far this year, recently did something that gives Susquehanna’s Stacey Gilbert pause about the market now. The VIX last week went inverted; the front month’s reading of expected volatility is higher than the reading of the next two months’ expected volatility. In other words, traders are anticipating higher volatility in the near-term than they are in the long-term. “So if things succeed and Trump gets through fiscal policy changes, you could have this notable upside pop over, let’s call it the next year to two years. And then the downside, obviously, it’s when everything doesn’t work out, or the geopolitical issues get crazier,” Gilbert said. What is important for investors to consider is that this comes while the VIX is at relatively low levels, Gilbert said. She expects that the market will continue to vacillate in a pattern of “small pullbacks, little rallies, small pullbacks, little rallies,” until more information about expected tax policy reform comes from the Trump administration. The S&P 500 was modestly lower in Tuesday trading as the VIX was higher around the 15 mark. France’s presidential election is a major test for euro zone unity, and the first round Sunday could bring on intense market volatility, depending on which candidates make it to the final leg of the race. French stocks slumped 1.6 percent Tuesday, after recovering from the worst selloff since the U.K. voted to leave the European Union last June. Investors globally have been hedging ahead of the vote by piling into safe haven assets like U.S. Treasurys and gold, and buying yen against the euro. “I think it’s potentially huge, or it could be nothing, and we’ll know that Sunday night before the market opens,” said Andrew Brenner, global head of emerging market fixed income at National Alliance. He said the spread between French and German 10-year bonds continues to widen, a signal of market unease. The candidate favored by markets is Macron, who is expected to beat Le Pen in the final vote. “If it appears Macron is in the race, all of this goes away for the near term,” said Brenner. However, Lichfield said Melenchon also stands a chance to win. Like Le Pen, he would be considered a disruptive candidate. A fan of Venezuela’s Hugo Chavez, he would like to tax individuals who earn 400,000 euros ($430,000) or more at a tax rate of 100 percent. He also would like to renegotiate France’s relationship with the European Union, and if it fails, he would seek to leave the EU. “Depending on how high [Le Pen] is, the market could react quite violently. If her runner-up is 6, 7 points behind her, many people would see that it’s possible she wins,” Lichfield said. The runoff election is set for May 7. “You hear people saying if Le Pen gets elected, France pulls out of the euro and the EU collapses. That’s utter nonsense. For France to pull out, there has to be a vote of Parliament and they’re overwhelmingly against leaving the euro,” said Robert Sinche, chief global strategist at Amherst Pierpont. There is a parliamentary election in June, and it in fact could be the more important election. Le Pen’s far-right National Front isn’t seen making much in the way of inroads. Chandler said a Le Pen victory could foster other nationalist groups in Europe, but it could also be a problem for Italy. Germany also has an election later this year. “The key would be not so much the German election, but the Italian election,” he said. Italy, under Prime Minister Paolo Gentiloni, has undertaken steps to provide emergency liquidity guarantees and capital injections for its banks. Former Prime Minister Matteo Renzi resigned in December, after Italy voted down a key constitutional referendum. The views on how France’s election could affect markets diverge as much as do potential outcomes. Lichfield said he sees a 35 to 40 percent chance for Le Pen to win. He said there are very slight odds, perhaps 10 percent, that financial market chaos erupts after the election. It could be so volatile it would send French yields skyrocketing and hurt the country’s banks. The long-shot scenario could even be extended to consider a French default at which point, France could be forced to leave the euro zone, Lichfield said. More likely is that European Economic and Monetary Union officials keep the situation under control and panic does not set in. Even so, a Le Pen win would not be a positive. “It will be negative because there’s this now complacent view that Brexit wasn’t so bad. Trump hasn’t been so bad, so why are we worried about Le Pen? But if you look at what she wants to do, if suddenly the market slowing into what her actual policies are and realize she’s right at the center of a vulnerable monetary union, then it becomes much more troubling,” said Lichfield.